Fondue much? I went through a short period of fondue-craze back in my 20’s. I think I owned at least 10-15 different pots at one time. But what’s not to love? 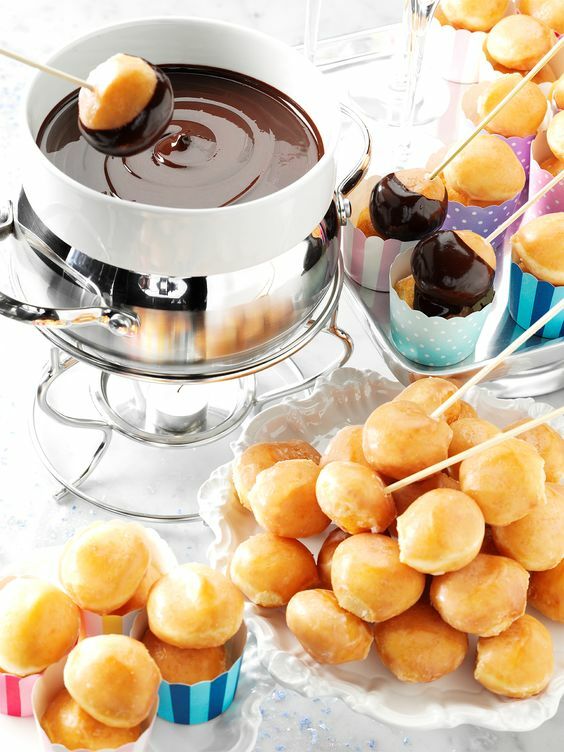 Fondue parties are an easy way to entertain and feed your guests at the same time. You can do a full-scale meal, or stick to dessert, with berries and bread dipped in chocolate. If you’ve got the right materials, it a pretty easy party to throw together at a moment’s notice. Everybody grab a fork! Swiss families first used aged cheeses and breads to feed families during the winter time. Basically, food is dipped into a communal pot of hot liquid. 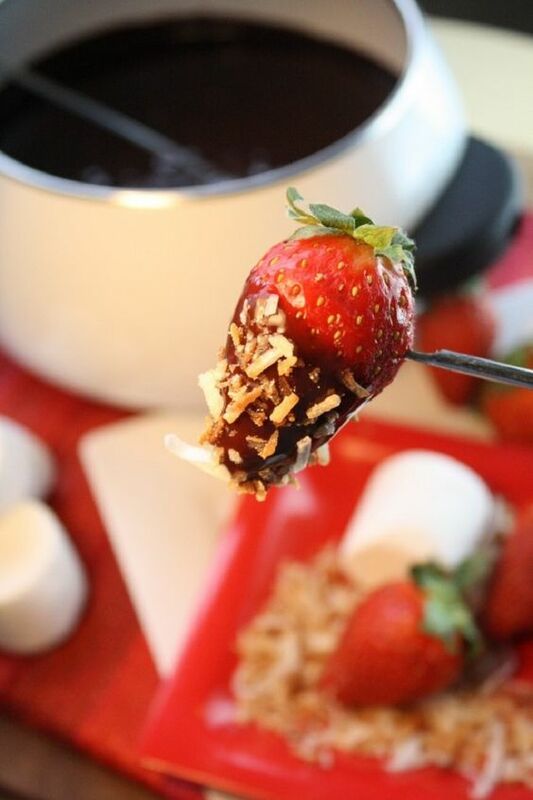 There are several types of fondue: broth, cheese, and chocolate. Everyone has a long, pronged fork that they use to serve themselves. Add pickles, onions, and olives for guests to snack on during the meal. As long as everything is cut bite-sized, you can use your imagination! 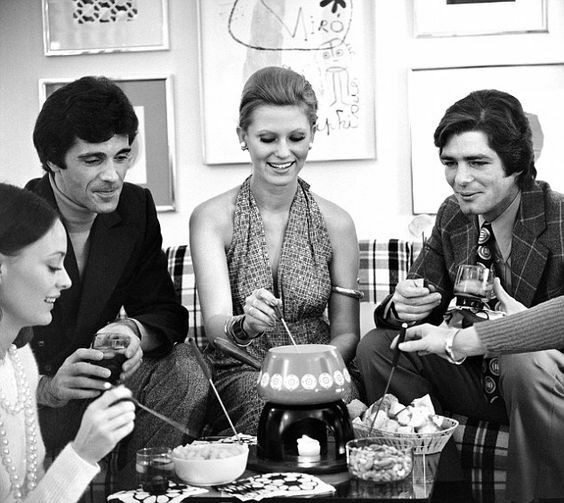 The 1970’s brought the dinner party to the masses. People were more well-traveled and were excited to show off their latest finds. Hosts were keen to show off their sophistication with the latest trends in both food and fashion. Exotic menus and sophisticated garnishes (AKA crinkle-cut veggies) were the delights of the night. So swanky! 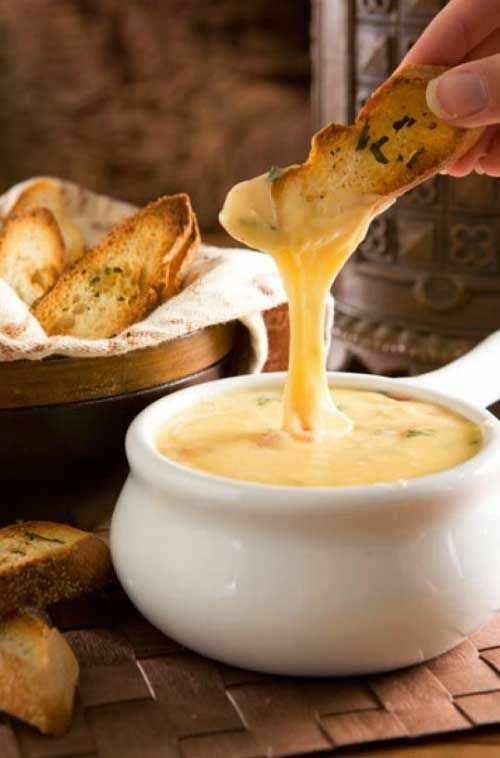 French food was considered the fanciest, and fondue was the creme de la creme. Some things just never go out of style. Music Alert! I love the disco pings in this track. Or what do I call that? Haha, leave me a comment at the end of the article and enlighten me. This is my brain on fondue. If you’re wanting to do the full dinner, fondue bourguignonne is the starter course. This traditionally includes frying cubes of beef in hot oil. Personally, I would keep this course to the professionals. 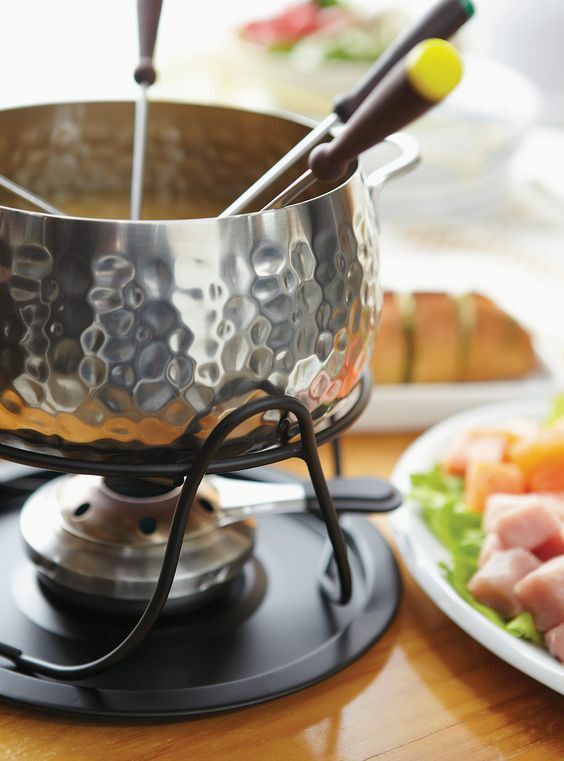 If you want the experience, find a fondue-specific restaurant in your area, such as The Melting Pot. Martha Stewart has a lighter version that I prefer to use below. 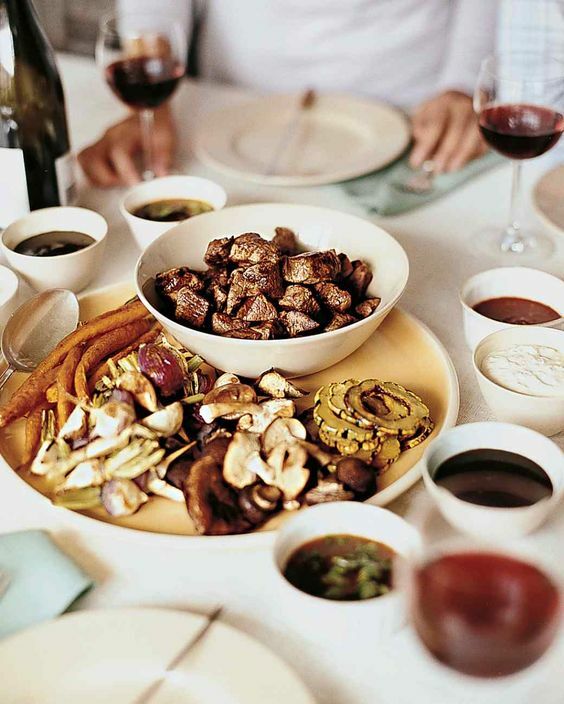 I would also do fondue chinoise (with fish or vegetables) this way as well. This is a basic no-fail cheese recipe that you can use as a base and doctor once you get more the hang of it. Try different cheese combos and different bread types too. Also, this recipe calls for kirsch, which is dry cherry schnapps. Although it is optional, I highly recommend adding it. The cherry flavor balances the sharp cheeses nicely. For the instructions, check out Epicurious and feel free to add a dash of ground nutmeg for a seasonal plus. Also, many people leave a thin coating of cheese at the bottom of the pot and turn down the flame to crisp it up. The gift that keeps on giving! Last but not least, best one of all.. chocolate! 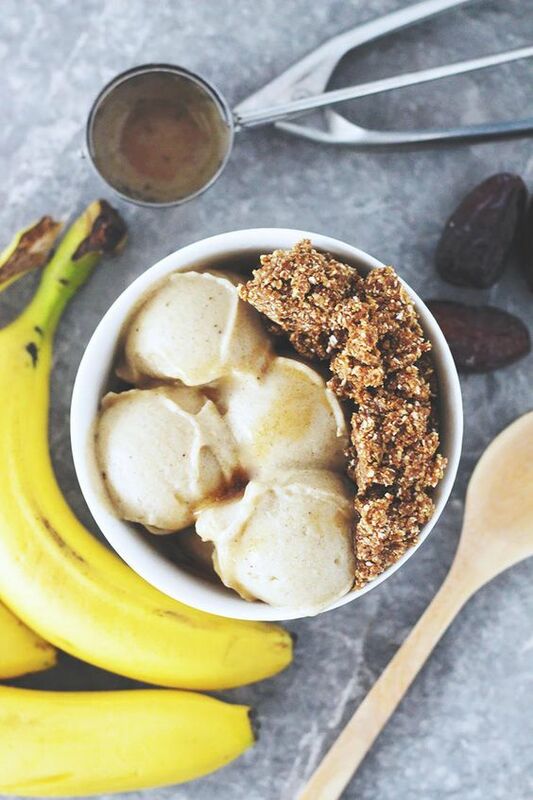 If you want a light dessert party with easy clean-up, look no further. Melted Swiss chocolate with a little liqueur is a sure-fire crowd-pleaser. Serve cubed angel food cake, berries, or even pretzels! I’ve even heard of bacon being added to the mix, so really, it’s up to you to be as creative as you want. Something about standing around a warm pot of amazing chocolate. It’s an easy conversation starter and the informality makes guests instantly feel at ease. 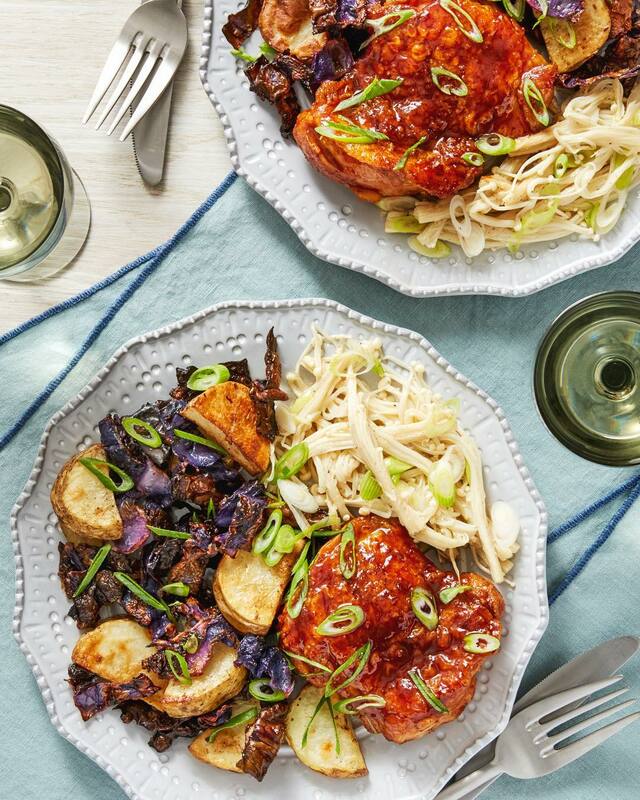 This recipe is super simple and compliments of Paula Deen. Get the full instructions on The Food Network. I actually use almond liqueur, such as Amaretto. Kahlua works amazing as well, just consider what you’re pairing it with. Also, I confess I use Lindt CREATION bars so my chocolate mix is pretty intense. Light-weights, never fear! 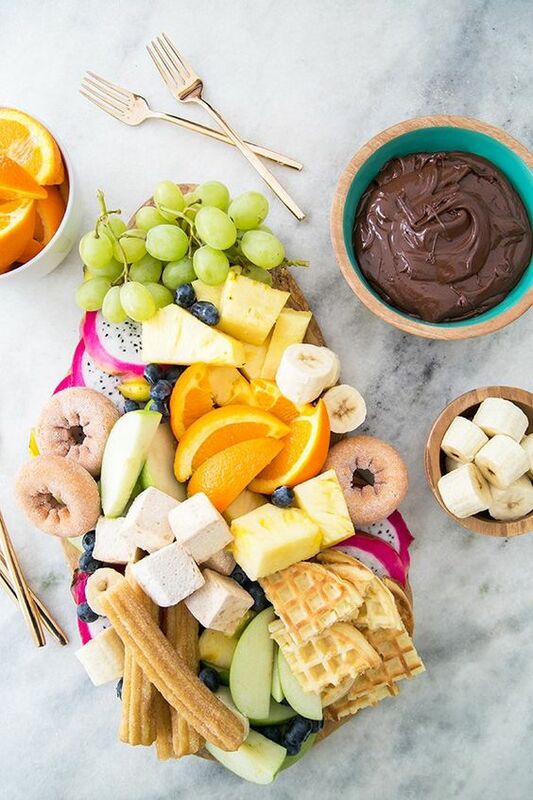 The beauty of fondue is that you can dip into as much or as little chocolate as your heart desires. 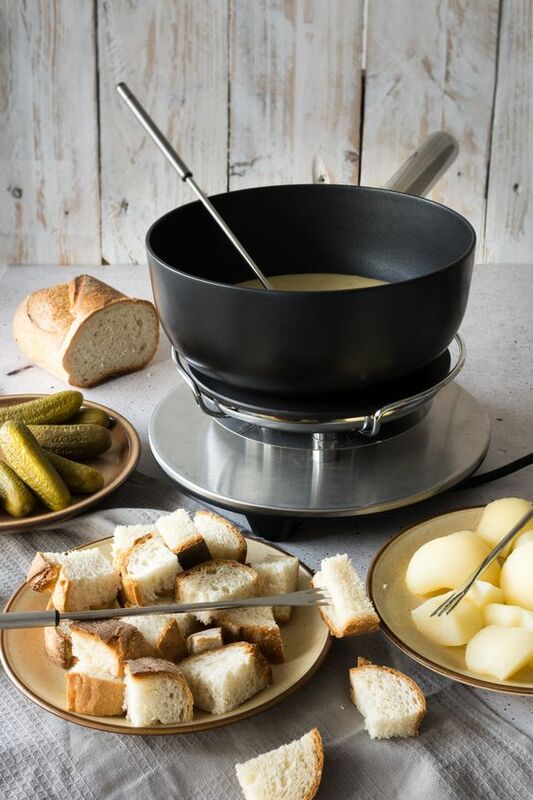 Generally speaking, fondue bourguignonne is best prepared in a cast iron pot like this one from Cuisinart that you can transfer from stove to stand. 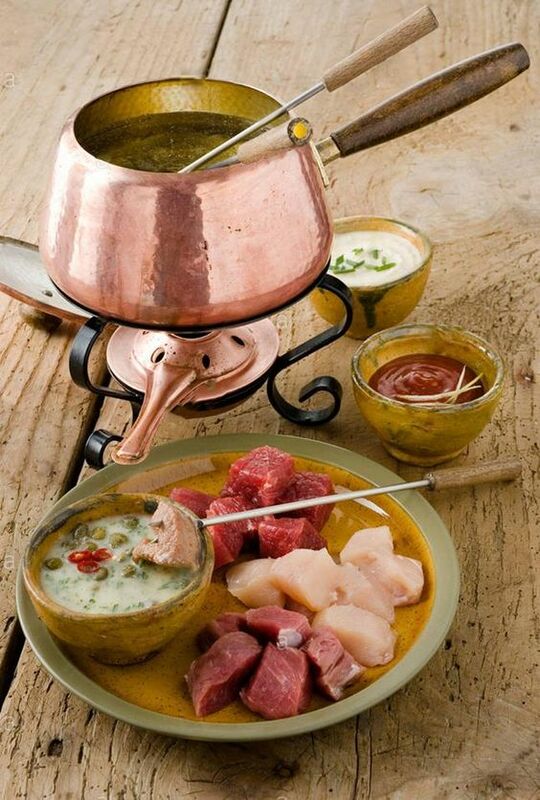 I like the cast iron for fondue chinois or cheese fondues as well, but ceramic would work too. Chocolate fondue is best served in smaller, ceramic pots. Be sure to stir often and pay attention to the amount of heat the holder is giving. Burned fondue is no bueno. The surest way to enjoy the holiday season is to keep it as easy on yourself as possible. 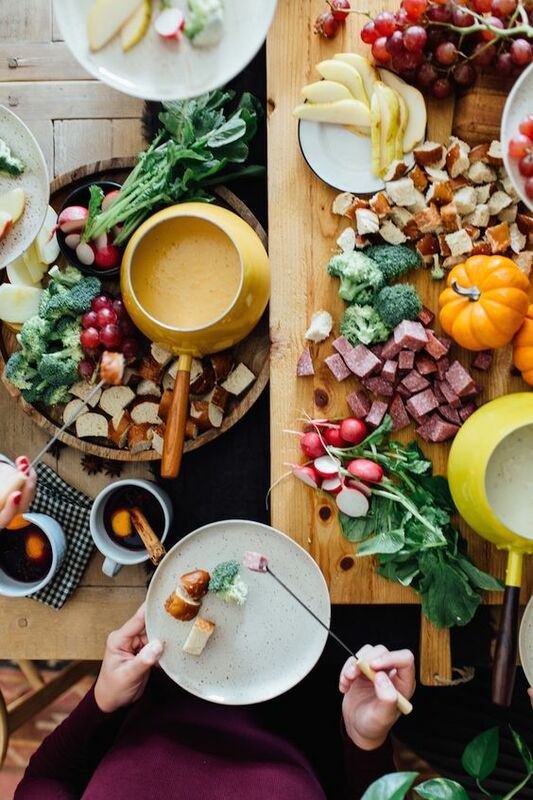 Fondue recipes are super simple, super casual, and generally require very few ingredients. 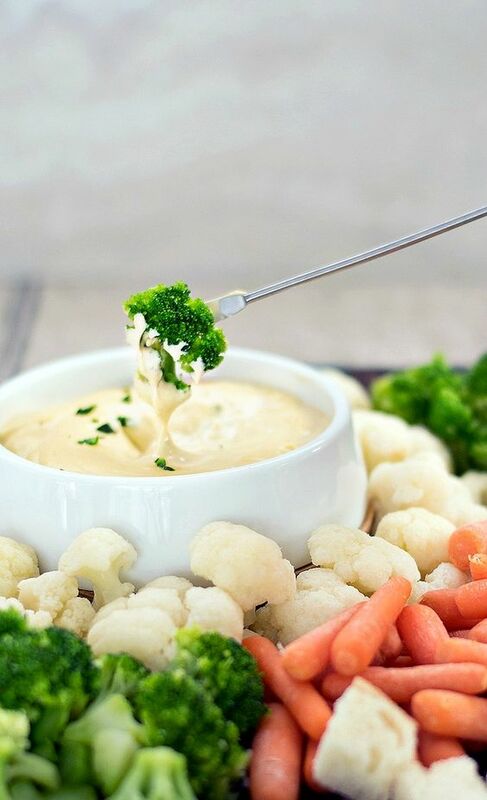 Stock up on anything and everything you’d want to use to dip and you’re done! Clean up is quick and the versatility allows you to cater to everyone’s dietary needs. What a kind and thoughtful host!